Berta Caceres, Honduran indigenous leader was assassinated on March 2, in the dark of the night, by armed assailants that broke into the Honduran home and shot her four times. The assailants also wounded a Mexican colleague, Gustavo Castro, who survived only by playing dead. After the news spread of her death, thousands took to the street to protest this vile killing of an indigenous leader loved and respected by so many people. Her love was felt in the Bronx, NY as well. 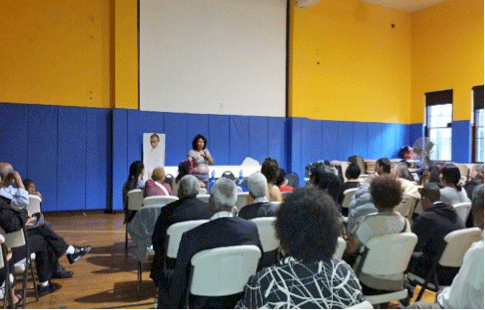 In September, 2015, we had the honor to meet and listen to Berta Caceres, from the Council of Indigenous Peoples of Honduras (COPINH), speak about the struggle of her indigenous people of Honduras in the South Bronx church Iglesias Evangelical Española del Bronx. She explained the constant killings of activists and organizer in her village who were fighting for a just cause; protection of their environment from the government’s plan to remove them and building dams that would have a treacherous effect on her village, food supply and rivers. She spoke about nature in harmony with the living style of the Lenca peoples. The intruders were causing irreparable damage to her people and environment with the present government that removed the Zelaya government by a coup in 2009. She expressed that their troubles began when her people were determine to protect their environment and they were successful in keeping out a Chinese dam construction company that was hired by the present government to make the dams. We shared with her the human rights violations committed to our longest held Puerto Rican political prisoner, Oscar López Rivera in prison for more than 34 years. She stood by side of Oscar’s full size image in the church as if he was also listening to her struggle (see photograph taken by Ana). She expressed to NY Coordinator to Free Oscar Lopez Rivera her deepest solidarity in favor of the human rights campaign for Oscar. As a leader and protector of the environment in Honduras, she was given the Goldman Environmental Prize (equivalent to a noble prize). These are the beautiful words of Berta when she accepted the Goldman Environmental Award in Washington, DC in 2015. In our worldviews, we are beings who come from the Earth, from the water and from corn. The Lenca people are ancestral guardians of the rivers, in turn protected by the spirits of young girls, who teach us that giving our lives in various ways for the protection of the rivers is giving our lives for the well-being of humanity and of this planet. COPINH, walking alongside people struggling for their emancipation, validates this commitment to continue protecting our waters, the rivers, our shared resources and nature in general, as well as our rights as a people. In the South Bronx, Bertha Caceres memory will always be of a woman that fought for what she believed in, loved her people and forever we will remember her and have a commitment to be in solidarity with her people.